At the University of Michigan, two fellowship opportunities are under the umbrella of the Ecosystem Management Initiative. Master's degree students are eligible for these fellowships. Wyss Scholars will be selected at SEAS on the basis of their leadership potential, commitment to furthering land conservation in the Intermountain West, commitment to pursuing a career as a practicing nonprofit or public-sector conservationist, financial need and academic strength. The Scholars are supported by grants from the The Wyss Foundation to selected universities. The University of Michigan is one of only four universities nationally to be chosen for these grants based on their superior interdisciplinary environmental programs and commitment to educating conservation practitioners. To date, SEAS has hosted ten cohorts. To learn more, please visit the Wyss Scholars page. EMI administered the Doris Duke Conservation Fellowships for the 13-year duration of the program. Doris Duke Conservation Fellowships were awarded to master's degree students who demonstrated outstanding promise as future leaders in nonprofit or governmental conservation. The fellowships were supported by grants from the Doris Duke Charitable Foundation to selected universities. 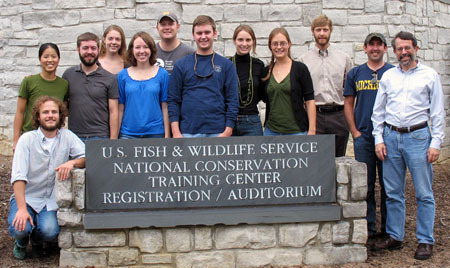 The University of Michigan was one of only eight universities nationally to be chosen for these grants based on their superior interdisciplinary environmental programs and commitment to educating conservation practitioners. Note that DDCF decided to end the Fellows program in its current form in 2011; hence, we are not selecting new fellows. To learn about the 13 cohorts of University of Michigan Duke Fellows, please visit the Doris Duke Fellowship page.